Madison Clark (Kim Dickens), son Nick (Frank Dillane), daughter Alicia (Alycia Debnam-Carey), and her fiancé Travis Manawa (Cliff Curtis) have plans to leave the city. Travis’s ex-wife Liza (Elizabeth Rodriguez) and son Chris (Lorenzo James Henrie) begin to learn that something dangerous is happening. Fear the Walking Dead continues its exploration of the initial stages of the epidemic through the lens of family by introducing us to the Salazar family—Daniel (Rubén Blades), his wife Griselda (Patricia Reyes Spíndola) and adult daughter Ofelia (Mercedes Mason)—who help Travis and his family. 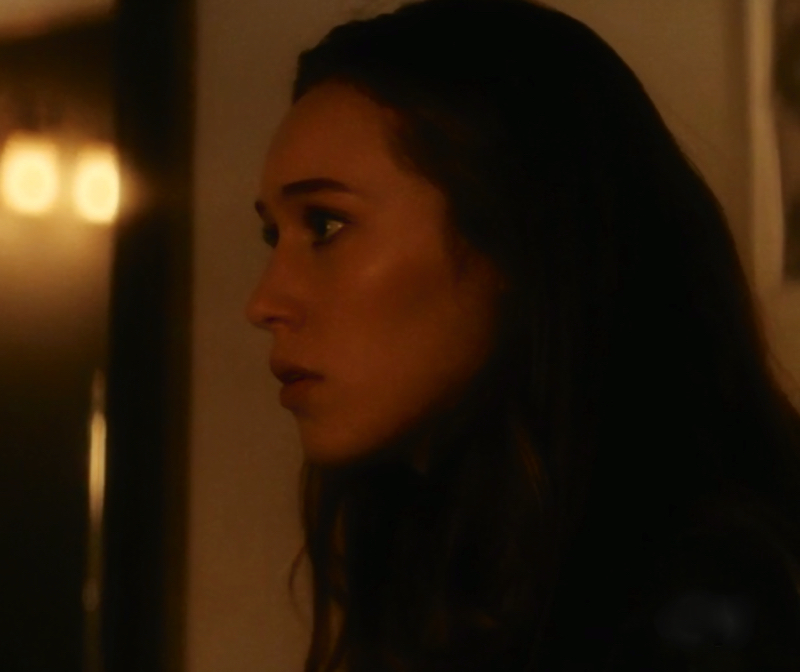 “So Close, Yet So Far” provides some outstanding acting, with Kim Dickens, Cliff Curtis, Frank Dillane, and now Rubén Blades being standouts in Fear the Walking Dead. The strong acting is enhanced with a script that effectively conveys confusion, fear, and anger. Just as the original series, The Walking Dead, is known for its “show, don’t tell” approach, Fear the Walking Dead gives us an exciting story grounded in emotion through concisely written dialogue. Yet, at times this approach can feel frustrating, as the audience wants to scream, “Just tell them!” There is the belief that if Travis or Madison can just explain to their children what’s happening that these teens will listen to their parents and take things just as seriously as we do. The audience has the benefit of foresight, whereas despite having seen drug dealer Calvin rise from the dead, Madison and Travis still don’t understand what’s going on. They do know enough to realize that people are getting sick, acting violent, and the city is not safe. Giving information at the wrong time can be just as dangerous as no information, particularly when it’s not clear to our protagonists how people are getting infected and what happens when they get sick. Both in Fear the Walking Dead and The Walking Dead, the idea of reanimated corpses doesn’t appear to be a cultural concept that has caught on. Even in our own zombie-obsessed culture, when we see someone on the news eating another person’s face we don’t think that zombies are real; instead we believe the explanation that it’s caused by a drug-induced hallucination. It doesn’t seem far-fetched that the idea of an infection making people rise from the dead and attack the living would take some time to come to terms with. 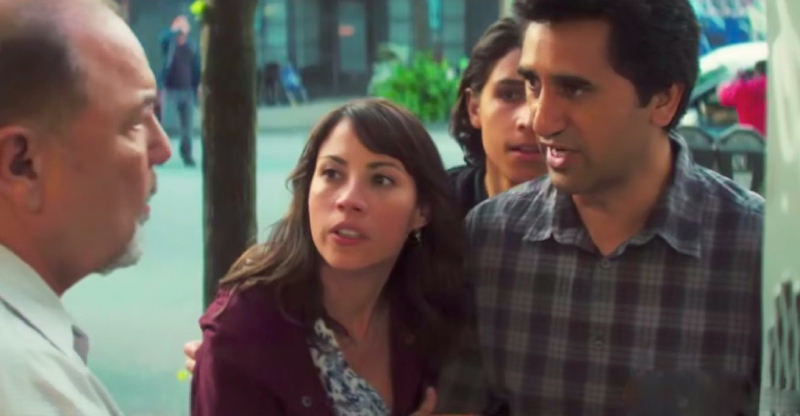 Though as the infection begins to hit different parts of the city in “So Close, Yet So Far, ” it seems that our characters won’t have much more time to adjust to the new reality in Fear the Walking Dead. Madison and Travis, along with son Nick, have just witnessed a case of the dead rising, and realize something is terribly wrong. As they frantically drive home, Nick changes the channels on the truck radio, finding no news of the dead rising. Confused, Nick points out, “No one’s talking about this. No one’s saying anything.” Travis and Madison understand they need to do something drastic and make a plan to go to the desert, away from people, until they know what’s happening. Their response is surprisingly astute, as many would assume they could just lock themselves away at home until the government got things under control. Perhaps these Angelenos realize their city can become a tinderbox in times of crisis. Meanwhile, Alicia goes to Matt’s house to find out why her boyfriend has been MIA all this time. She finds him at home, very sick and feverish. Despite her mother’s request that she go home and pack, Alicia has no intention of leaving her deathly ill boyfriend, whose parents are in Las Vegas (but probably already dead). Travis, Madison, and Nick arrive at Matt’s house to pick up Alicia. When Alicia leaves the room, Travis finds a bite on Matt’s neck and Madison asks, “Is that how it happens?” Travis points out that Calvin was shot, saying, “it wasn’t like this.” They’re trying to put the pieces together. When Alicia comes back in to the room, she tells Matt she doesn’t want to leave him and she loves him. Matt tells her that his parents will be home soon and to go with her family. Before they leave, Madison thanks Matt. Though he never says how he got the bite, Matt appears to realize something very dangerous is going on, and that Alicia needs to go with her family to be safe. Madison tells Nick that he saved them. He reminds his mom that he’s “about to enter a world of sh*t,” referring to the opioid withdrawal he’s about to go through. It’s a good metaphor for the pain everyone is about to experience, coming to terms with the impending apocalypse. Madison can’t get in touch with Nick’s doctor and realizes she needs to get him something to deal with his withdrawal. She makes Alicia promise to stay with her brother and leaves to get medication. Travis leaves to collect his ex-wife Liza and their son Chris. 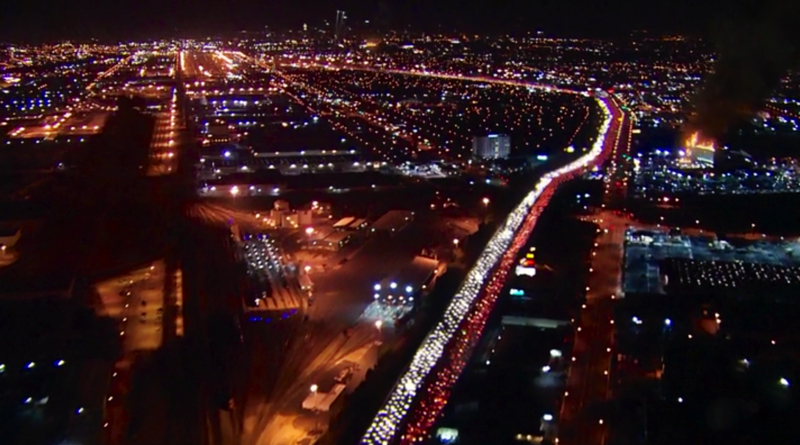 There is already traffic starting to form in the city. He calls Liza on the way. Liza doesn’t understand the urgency of Travis’s request to call Nick and get him home, and is instead focused on their custody agreement. On his way to find his family, Travis sees a policeman buying gallons of water. It’s clear that those in the know are preparing for things to come, even while most of the LA remains unaware. 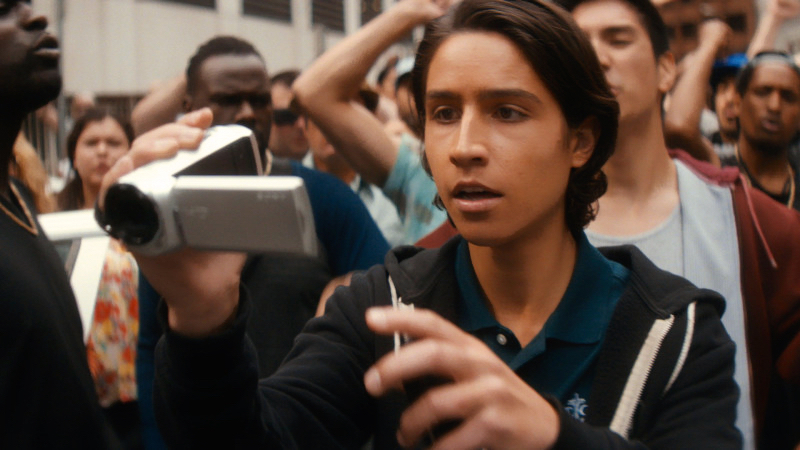 The teenagers in Fear the Walking Dead don’t seem to want to listen to their parents. As with all teens, they believe they know what’s best and that their parents just don’t understand. Despite promising her mother she would remain at the house with her brother, Alicia wants to leave to go see Matt. Nick begs her to stay, but she doesn’t seem willing to listen. Just as she’s about to go, Nick begins to have a seizure, forcing her to stay. Meanwhile, Chris is out in the community ignoring his father’s calls. He’s seeing the chaos start to unfold in downtown Los Angeles. He gets off the bus to film bystanders protesting the shooting of an unarmed man in the street. When Travis finally gets through to Chris by calling him on Liza’s phone, Chris tells him that he can’t come home because he’s at a protest. He tells Travis, “The people were taking action. This is important, Dad.” He tells his dad, “I’m a part of it, okay?” and hangs up on his dad. These teens today with their boyfriends and political beliefs! The end of privileged adolescence may be the only good thing about the apocalypse. As Madison and Tobias prepare to leave, they hear one of the infected through the intercom system. On the way out they encounter the principal Artie, who is clearly infected, and dead. Despite Tobias’s warnings, Madison tries to talk to Artie, telling him they’ll get help. He attacks her, but Tobias fights him off with his recovered knife. The infected principal stumbles towards Tobias and knocks him down the stairs. He comes very close to biting Tobias, but finally Madison smashes his head in with a fire extinguisher. Madison drives Tobias home and for the first time, there are warnings on the radio telling Angelenos to stay inside and not travel, but without any specific warnings about the infection or violent zombies. When Madison offers, “You can stay with us, Tobias, until this is over,” he responds, “This doesn’t end.” We kind of love Tobias and hope he makes it so we can see him again. He seems like a survivor. Travis and Liza have found Nick at the protest. He ignores his dad’s pleas to leave, telling him, “This is what you taught me. Dad, we stand up for people.” When Liza, who is training to be a nurse, sees the body and the infection control emergency workers, she realizes something is really wrong and tells Chris to listen to his father. They try to get out of the area, but the police arrive in riot formation and people are unable to leave the area. As the streets start to erupt in chaos, they manage to beg the Salazar family for shelter in the barbershop with metal security doors. When it becomes apparent there is no other exit, Travis, Nick, and Liza realize they must stay until it’s safe to leave. Travis wants to move away from the metal doors, but Daniel doesn’t trust these strangers, and he and his daughter Ofelia tell Travis not to enter the back, where their home is. As the night progresses, they sit in the shop listening to the chaos unfold. Madison makes it back home and gives Nick some OxyContin to help him through his withdrawal. Madison goes into the bathroom and takes a minute to herself to have a little breakdown. She did just kill her boss, a man she seemed to like and trust. Though Rick Grimes was trained to defend himself and kill when needed, Madison is just a guidance counselor. She has already seen her son run over Calvin multiple times, killed a man she knows, and learned that her world is no longer safe. Before she gets much time to express her grief, Travis calls and tells her that he’s with Nick and Liza and they’re safe for the moment. He suggests they leave and go to the desert on their own, that he will find them. Liza doesn’t want to go without him, then they get cut off. Alicia confronts her mother, demanding to know what’s happened. Before Madison can respond, they hear their neighbor, who’d been having the birthday party. screaming. She’s being attacked by the man who’d been coughing earlier. Alicia wants to go and help them, but her mother stands in front of the door, not letting her daughter leave the house. Back at the barricaded barber shop, Mrs. Salazar prays. In “So Close, Yet So Far” most people have not yet learned to fear the infected, and have been given no warning about the dangers of the dead. It appears that news about the infection has been kept from the public. On Fear the Walking Dead the public interprets what they see as police brutality, while television viewers sympathize with these first responders who are trying to manage an unmanageable situation. On the other hand we see some emergency personnel who are focused on saving themselves and their families as order begins to break down. While it’s not clear if Madison truly believes the government will contain things as she told Tobias, Travis is beginning to see evidence that the government may not be willing, ready, or able to help the general population from this threat. 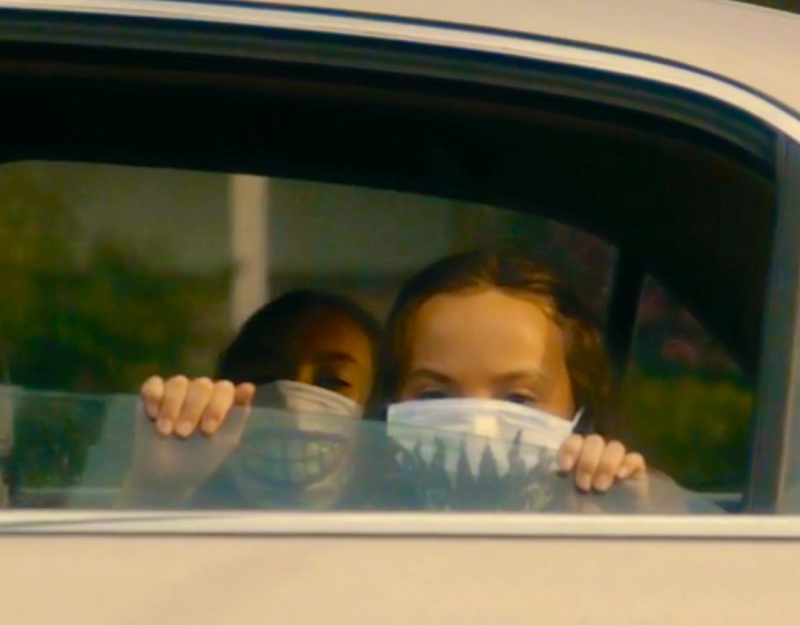 In “So Close, Yet So Far,” Fear the Walking Dead gave us an exciting episode, using the audience’s knowledge of the infection and eventual apocalypse to full advantage.